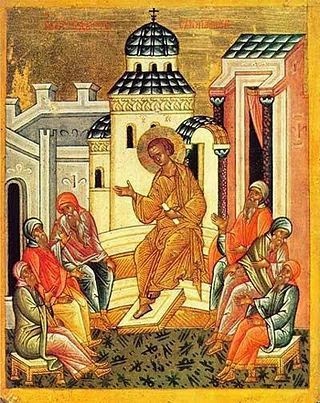 Orthodox Way of Life: Mid-Pentecost - What is the Significance of this Important Feast Day? Mid-Pentecost - What is the Significance of this Important Feast Day? We are at the mid-point between Pascha, the Resurrection of Christ and His victory over death, and Pentecost where He sends down the Holy Spirit, the “living water,” so we too can follow Him. In this feast we continue the celebration of the Resurrection that emphasizes the Divine nature of Christ. Simultaneously, we are reminded that the descent of the Holy Spirit is coming soon. We should become aware of the joy our soul seeks to receive His Grace through the Spirit. It is His grace that enables us to follow His teachings, to make our lives Christ centered, to live united with Him in hope of our Resurrection. We are encouraged to think of the joy in receiving the Holy Sprit so that we too can share with others the love God gives us. We can become His light that shines through us like “rivers of flowing waters” (John 7:38). During the feast we can reflect on the nature of our faith and how weak it is in these times, how few follow His teachings. We too often say that it is more important for us to follow our inner feelings and not to be constrained by His teachings. We think this is freedom. But let’s realize when we say this we are admitting we are a slave to the norms of our current secular culture instead of God’s hopes for us. The way of our times is not true freedom. It will not lead us to eternal life in His kingdom. In this feast we are reminded to thirst for what is beyond earth, beyond our feelings, beyond our self-centered wants and desires, to thirst for the Holy Spirit that is to be sent to us by Christ Himself on Pentecost. This will bring us true joy, true freedom, and the strength to follow Christ. refresh my thirsty soul with the streams of piety;for thou, O Savior, didst say to all:Let him who thirsts come to Me and drink.O Christ our God,Source of Life, glory to Thee.